> little more upscale? In the same vicinity as PG? Definitely in the same vicinity. I don't know about "more upscale." Edited 1 time(s). Last edit at 01/11/2013 01:55PM by old man from dallas. Pleasant Mound was centered at Scyene and Buckner where the cemeteries are located. James J Beeman and Wiiliam Pruit were early settlers in 1843-46. Pleasant Grove was settled about 1846 to1850 by the Brutons and others. It had the first highschool built about 1916 facing Buckner at Lake June. Connor Junior High and a elementary were built around the corner in the 1940s. I believe Pleasant Mound's first school was Urban Park Elementary, in the old Peacock Military Academy on Military Parlway at Jim Miller. The first post office was located on James Beeman's survey in Pleasant Mound then moved to Scyene in 1856. The Scyene Community at Scyene and San Augustine was the earliest trade center. When the T&P bypassed Scyene in 1873 Mesquite was born and trade shifted there. When I lived in Pleasant Grove in the late 1940s it had a larger commercial area with the Big World Store and soon after a strip shopping center. Pleasant Mound had a couple of cafes and service stations and the rodeo. There was an airfield NE of Buckner and Lake June from about 1945 and at one time destined to be the equal of Red Bird but lost out. Both communites saw substantial growth after WWII particulary from GI housing. The communites and schools districts were annexed by Dallas in the early 1950s. There were more new homes built in the 1960s and 70s mostly eastward from both communites. Westward Parkdale and Urbandale had already been developed in the 1930s and 40s. 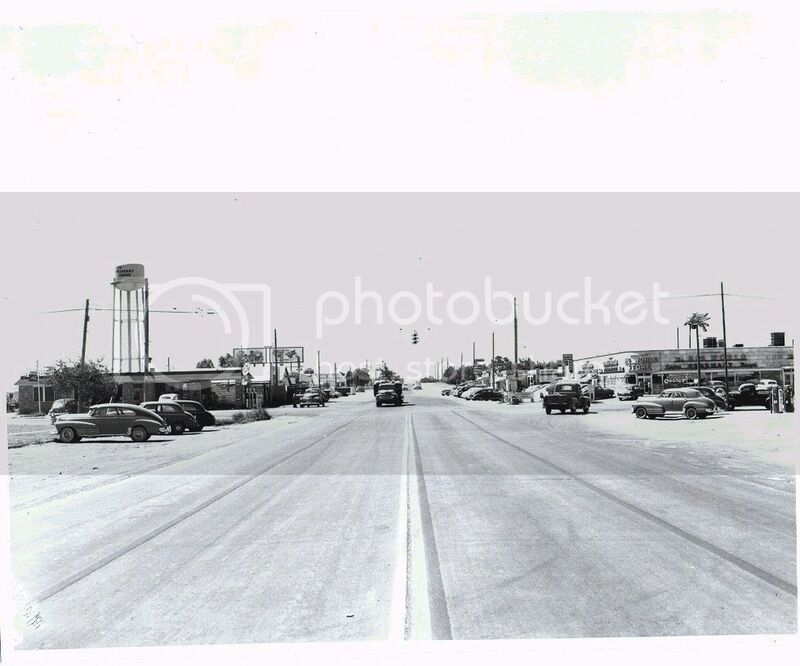 Pleasant Grove ca 1950 looking south on Buckner Blvd at Lake June Road. Edited 1 time(s). Last edit at 01/11/2013 06:09PM by M C Toyer. I had no idea Big World was that old. I agree with the 1950 date on the picture. I see only 1950 or earlier autos. I'm pretty sure the Big World Store dates back to the late 1930s because I have an account where it burned and was rebuilt about 1939. Ownership changed over the years and I believe Robert L Thornton had some part in the beginning. It was a modern building in the photo and from what I recall in the late 1940s but was truly an old time general merchandise store. It had hardware, household goods, food, and clothes and shoes because I recall repeatedly putting my foot in the x-ray machine there. It's a wonder my feet don't glow in the dark as much as they were radiated. I remember Roger Holcomb telling me that when he built his funeral home on Lake June Road, east of South Buckner Boulevard that the existing building, a feed store was demolished and the lot leveled and cleared. I remember the lot was unusual, not very wide, but extremely long. The parking area behind the funeral home was enormous. He told me there was an airport located directly south of his southern property line, but I do not recall anything remaining that would resemble an airfield. I also remember somebody telling me that Mr. and Mrs. Stewart, owners of Stewart's Truck Stop which was originally located at South Buckner Boulevard and Second Avenue (later C.F. Hawn Freeway) got their restaurant beginning at the coffee shop at the airfield. That would have been in the late 1940's. I also remember somebody telling me that Holcomb Road was named in honor of Roger, but I do not know the circumstances or reason. Roger later worked for Hughes Buckner Chapel. Most remember that stinky cigar and those AWFUL jokes, a real character. I drive down Buckner Boulevard now and tears come to my eyes. Loved working the GROVE back in the late sixties, always something different and unusual and miss the PIG STAND and Chubbie's. 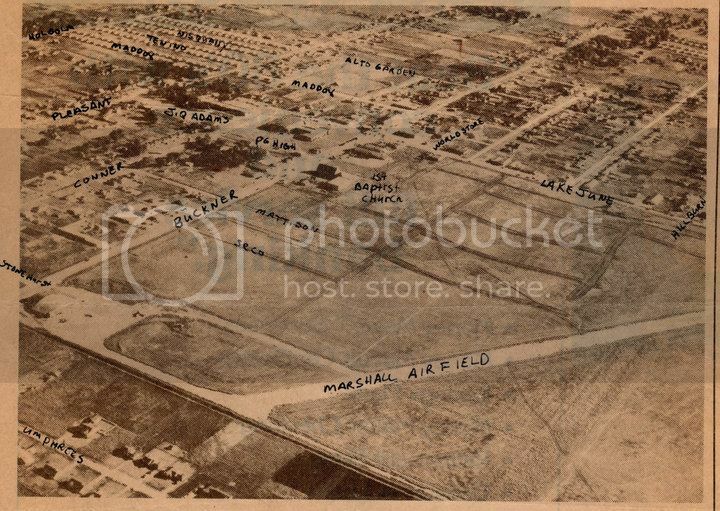 Marshall’s Field, Inc. was a private flying field owned by James W. Marshall, Sr. that went into operation in 1946. It featured the Gulf Aeronautics Flying School. Gulf Aeronautics was owned by James W. Marshall, Sr. and Otto M. Vehle. It was advertised as “The Department Store of the Air” and “NAvion Factory Dealer.” The NAvion was a four-passenger plane built by North American Aviation. It had a cruising speed of 150 miles per hour and a range of 500 miles. In February 1948 Marshall’s Field received an award from the National Aeronautics Association as an approved landing facility. At that time Marshall’s son, James “Jimmie” W. Marshall, Jr., was the field manager. James W. Marshall, Sr. died in March 1948. The first Pleasant Mound School was built on Scyene where the Osteopathic Hospital now sits empty. the school was actually located in Urbandale. This predates the school on Military. Pleasant Mound was annexed to Dallas in 1950. Pleasant Grove was annexed to Dallas in 1954. Bruton Road was the northern boundary of Pleasant Grove and the southern boundary of Pleasant Mound. The airport was Marshall Field and was located on the west side of Buckner just north of Lake June. It opened in Oct. 1946 and closed in March 1949. The land it was on became Pleasant Grove Shopping Center and behind that a housing Development. The S.S. Conner Bldg. (housed Pleasant Grove High School), Big World Drug Store and the Grove Theater were all built within a few months of each other in 1937. Pleasant Grove has come a long way with the addition of a satellite campus of Eastfield College, a new Library, and many new shopping and dining options. Nearly all older shopping areas have been updated and remodeled. Dallas annexed areas (mostly towns), in the southeast quadrant of the city from 1945-1978 with a portion of Seagoville being the last addition. There are 11 separate communities in southeast Dallas south of Bruton.